This Friday evening is 'Mad Hatters' at the V&A, to accompany the Stephen Jones exhibition. I was chosen, along with some other designers to make an Easter Bonnet out of I-D Magazine. Louise, Rosemary and Zara, helped me shred and card all the paper a few weeks ago, and then I spun a yarn, and knitted a bonnet which you can come and see, along with lots of other fantastic bonnets including one by Tatty Devine and Rob Ryan, and all the other Mad Hatters. Why are Hatters Mad? Well we were just discussing it, and it seems that Lewis Carrol made them mad, but really it was the mercury they used in the hat moulds at the millener's Luton, turned all the hat makers mad. What a shame. I hope to see you on Friday. The great and good 16-21 year olds of London Town are preparing a Candlelit Matinee for you this Saturday 21st March 2009 3-8pm at Shunt Vaults, Joiner Street, London Bridge. Hansel and Gretel's Gingerbread Oven, Red Riding Hood and the Bed Stage, King Midas and the Sacrificial Tree, The Waiting Room of Death, The Fiarground of Fortune, The Theatre of Shadows, Climate Rush Mirror Protest, The Mobile Phone Story Machine, We Are What We Do Badge Factory, Learn To Love You More Fairy Tale Assignments, Stoke Newington International Airport and Le Gun Magazine, The Alchemist's Laboratory, Matthew Robins Shadow Puppet Opera, The Inn at the End of The Road, BFI Fairy Tale Cinema, Mermaid Nation, Prick Your Finger and Make Mushroom, Live dance and theatre and a fully functioning Boxing Ring. There is limited capacity so be early. See you there or be square! Next Saturday 9th August we highly recommend the Field Day Festival in Victoria Park. We will be teaching spinning next to Pom Pom International, and there is a whole pot pourri of brilliant bands, good bars and classy loos. 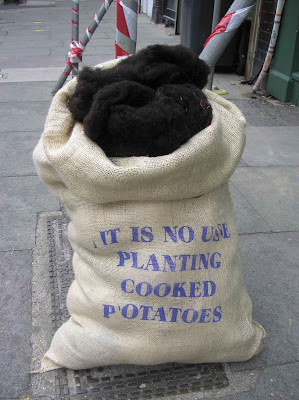 So Roll Up, and don't forget, it's no use planting cooked potatoes. (We are especially excited to be working with Natalie and Tom from 'Return to the Rural'. Seven years ago, Amy and I started a knitting Club. It didn't have a name and we were sitting on the steps of the White Cube Gallery in Hoxton Square, when we spotted a poster on a lamp post saying, 'Return to the Rural'.